Run SMART Rebranded | Run S.M.A.R.T. We hope you like the new look on the outside cause it’s consistent with how Sascha designed our new training calendar software under the hood. As we open up our services and build the largest community of runners looking to get faster we wanted a fun color scheme – one full of vitality! The color scheme is also a better fit for some of the cool features we have in store on the app. With a bright new design comes a brand new experience when signing up for Run SMART coaching. There are plenty of paid coaching services online for runners but there are no running apps that tell you how to get faster. Thousands of runners log their training data but have to interpret what it means unless they’re paying a coach to do it for them. This is where VDOT comes in. VDOT O2, powered by Jack Daniels’ running formulas, is a free training app that determines a user’s current fitness and provides accurate training paces while they manage their training calendar. 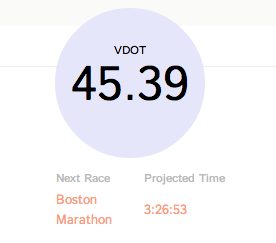 As users log their training the VDOT app will update their paces based on recent race results. The app is fun and encourages competition by providing everyone a color-coded VDOT score and soon to come age-based ranking in their community. Like the karate belt system, runners can mark their progress by advancing to the next color or fitness level in Jack’s VDOT scale. *While in beta the app will remain invite-only until our public launch in the spring. Each user will receive 10 invites to share with friends. When you purchase a custom training plan or private coaching your training will now be uploaded to your training calendar on VDOT. Without an invite, this is the only way to get on the app while we’re in beta. No more emailed schedules and digging for past race results and workout splits! VDOT allows you to store workouts, racing history and helps you determine when it’s time to update your training paces. As part of our rebrand we’ve launched new training products on the app from Dr. Jack Daniels and for the first time other Run SMART coaches (see below). Over the course of the next few months you’ll be seeing more coaches selling custom plans for upload on your training calendar. This is one of the biggest changes to our products/services as we try to provide more options and access to the minds of some of the best distance runners in the world. That’s it for now. We’ve accomplished a lot and have even more in progress as the team keeps growing. Over the course of the next few months we’ll be adding many new features to the app and releasing iPhone and Android versions of VDOT. Please join us on Facebook, Twitter or sign up for the Run SMART Project newsletter list to stay updated. I would love to test out the VDot2 running app is it possible I could get an invite? I am got this email off your Facebook page and am a fan of Jack Daniels running book.